I´m showing a card I made for my Guest mission with 7 Dot´s studio. 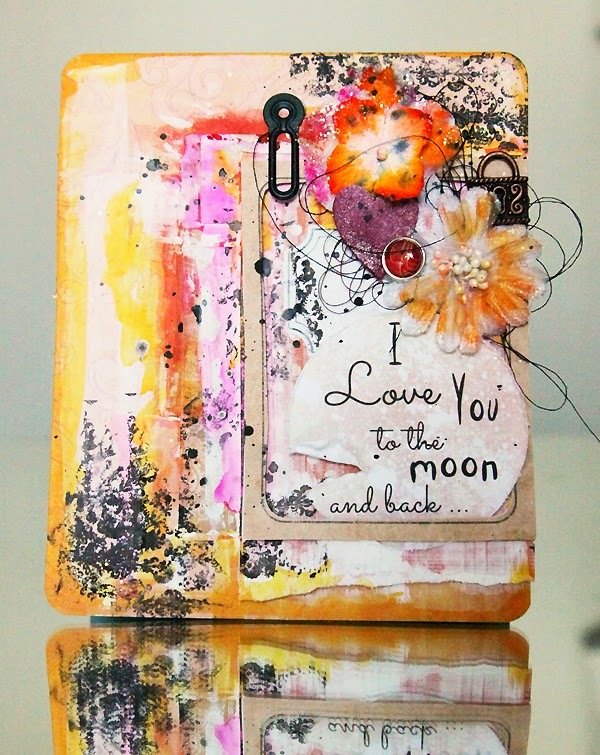 This card was made using 3 collections - Hopefully, Love is in the Air and Messy Head. The card was made using a patterned paper as base (Love is in the air - Illusion). I layered a couple of leftover pieces from the same paper and covered it with different layers of gesso and ink. When dry I added the randomly stamped details (stamp fom Prima Marketing). The frame was cut out from Hopefully "Never let me go". The sentence is a round die cut from the Messy Head line. Decoration is from my stash and if I don´t remember wrong the heart is Maya Road and the flowers Prima. The photo holder is 7 Gypsies i think. Ink from Ayeeda (13arts). Simply Gorgeous !! love the colors, the layering !! Love the colors and the layering! !